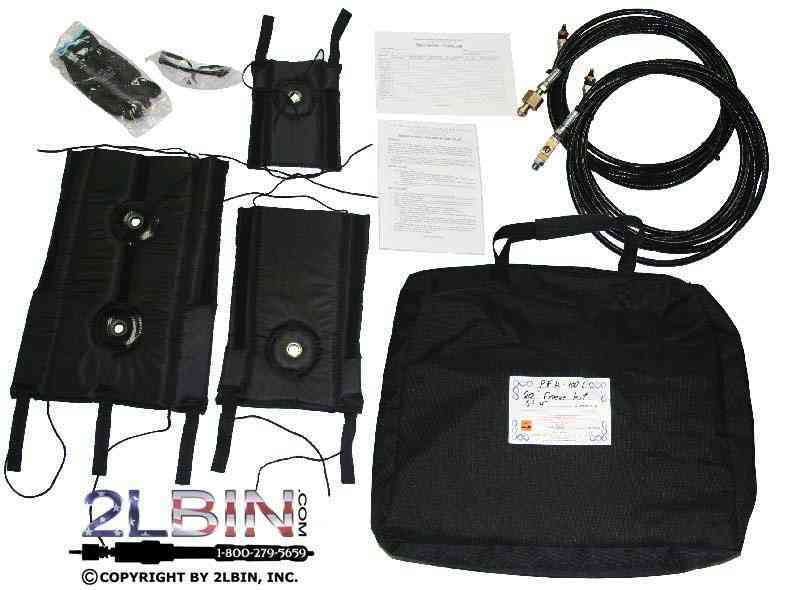 The Pipe Freezing Kit eliminates the need to drain systems and shut down operating equipment when making pipe repairs. The kit uses liquid carbon dioxide to create ice plugs in sections of pipes. Kits are supplied with three freezing jackets for pipes ½"-4" (13-77mm) O.D. To operate, turn off the pipe flow and attach a freezing jacket to the pipe upstream from the section needed to be repaired. Fill the freezing jacket with CO2 and an ice plug will form. After completing whatever work is needed, remove the jacket and the ice plug will defrost. The Kit can be used for pipes ½"-4" (13-77mm) O.D. and includes three freezing jackets, two 7.8' (2.4m) hi-pressure hoses, a T connector, and a 20 lb (9.1 kg) CO2 cylinder (unfilled). Pipe freeze plugging is a simple, cost-effective method to perform pipe maintenance or line modifications without shutting down your plant processes. Using liquid carbon dioxide (CO2) you can isolate the problem area in the line with SOLID freeze plugs of the fluid within the line. This allows the job to be done with no drain-down or refill, no loss of expensive process fluids, and no system downtime. Once the work is completed, the plugs are thawed and the line is back in operation. Standard freeze plugs range in size from ½" to 3" (13-77mm) O.D. 1 unit of small Jacket for pipes ½" - 1" (13-25 mm) O.D. 1 unit of medium Jacket for pipes 1" - 1½" (25-38 mm) O.D. 1 unit of large Jacket for pipes 2" - 4" (38-114 mm) O.D. The Pipe Freezing Kit eliminates the need to drain systems and shut down operating equipment when making pipe repairs. The kit uses liquid carbon dioxide to create ice plugs in sections of pipes. Kits are supplied with three freezing jackets for pipes ½"-4" (13-77mm) O.D and two 20' hoses. The Kit can be used for pipes ½"-4" (13-77mm) O.D. and includes three freezing jackets, two 20' (6.1m) hi-pressure hoses, and a T connector. The Pipe Freezing Kit eliminates the need to drain systems and shut down operating equipment when making pipe repairs. The kit uses liquid carbon dioxide to create ice plugs in sections of pipes. Kits are supplied with three freezing jackets for pipes ½"-4" (13-101mm) O.D. The Kit can be used for pipes ½"-4" (13-101mm) O.D. Pipe freeze plugging is a simple, cost-effective method to perform pipe maintenance or line modifications without shutting down your plant processes. Using liquid carbon dioxide (CO2) you can isolate the problem area in the line with SOLID freeze plugs of the fluid within the line. This allows the job to be done with no drain-down or refill, no loss of expensive process fluids, and no system downtime. Once the work is completed, the plugs are thawed and the line is back in operation. Standard freeze plugs range in size from ½" to 4" (13-101mm) O.D. 2 units of small Jacket for pipes ½" - 1" (13-25 mm) O.D. 2 units of medium Jacket for pipes 1" - 1½" (25-38 mm) O.D. 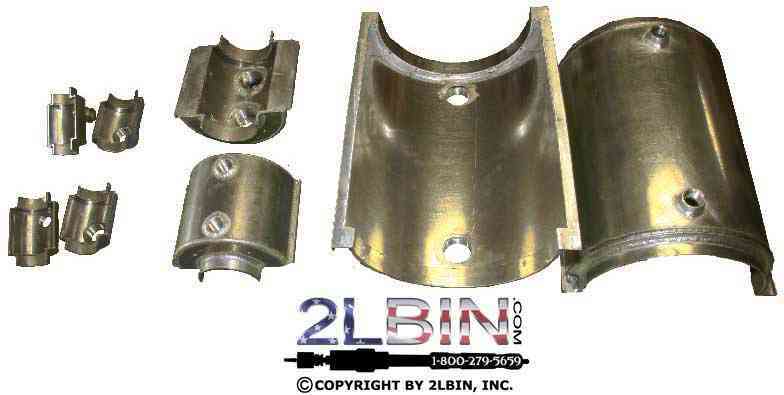 2 units of large Jacket for pipes 2" - 4" (38-114 mm) O.D. Operating Instructions – Pipe Freezing Kit Model PFK-5-3, PFK-5-3 and PFK-DBL-5-3. *Kit does not include Co2 bottle or cart however you can easily buy the Co2 bottles locally. 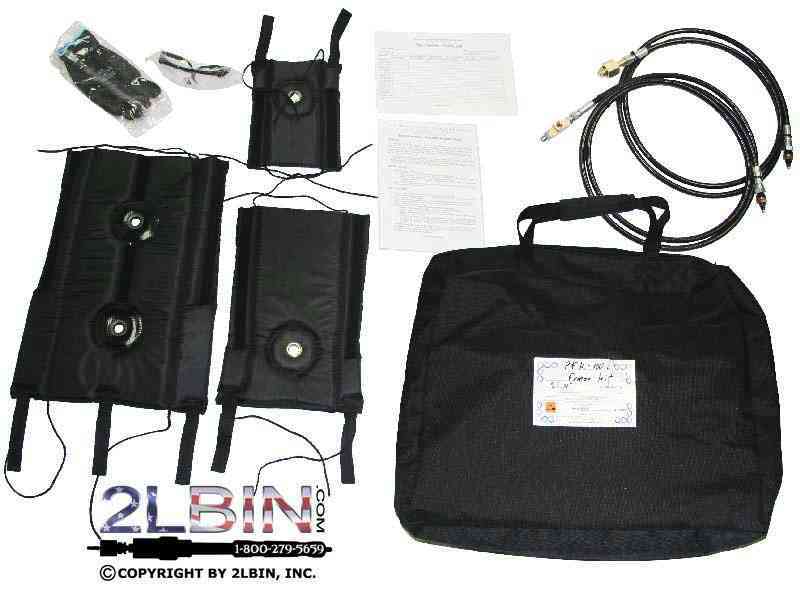 The 2LBin.com pipe freezing kit uses liquid carbon dioxide to freeze stationary water in pipes. 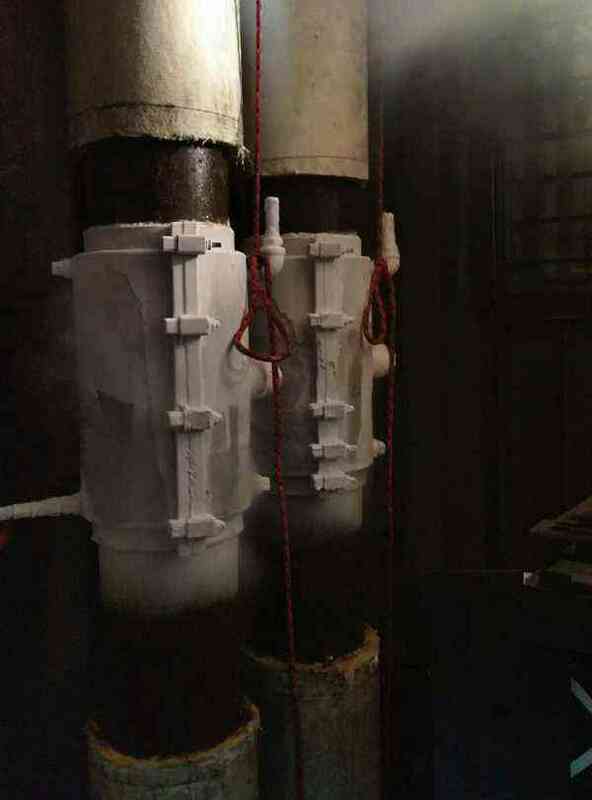 A very low "dry ice" temperature (-109ºF/-78ºC) inside the freezing jacket creates a secure ice plug within the pipe and blocks the flow of liquid, allowing repairs or modifications to be made to the piping system without draining or shutting down the entire system. 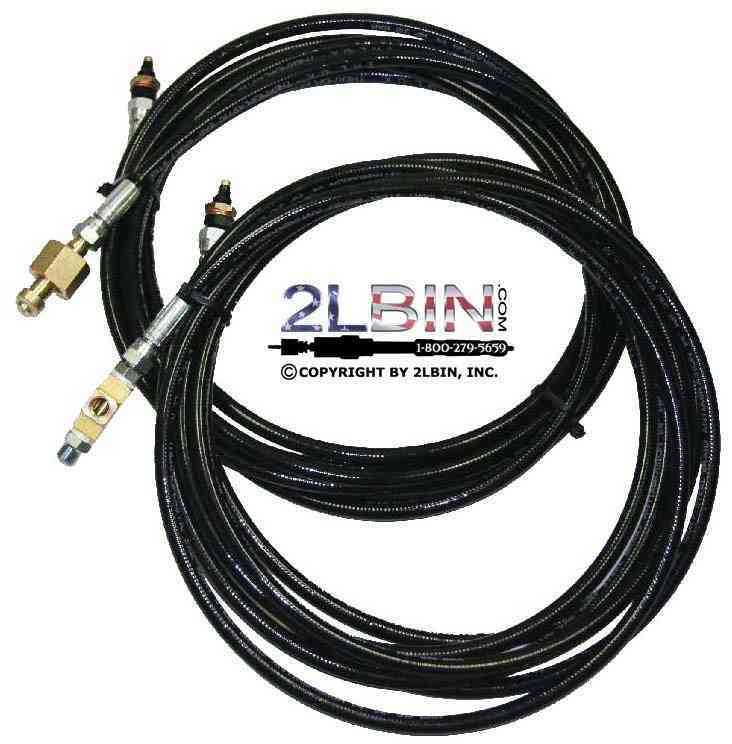 Three freezing jackets, for 1/2" through 4" pipe, are supplied with the 2LBin.com Freezing Kit. The pipe freezing technique can be used on iron, lead, steel, copper, and plastic pipe. The 2LBin.com pipe freezing kit does not come with an empty CO2 cylinder. Check the local telephone directory or yellow pages for a source of CO2. Look under the headings "Gas-Bottled and Bulk" or "Welding Equipment and Supplies"
a. Stop the flow of water through the pipe. Moving water will not freeze. b. Water temperature should be at room temperature (75ºF/24ºC) or colder whenever possible. Warmer water takes much longer to freeze and hot water will not freeze. c. Thoroughly clean the section of pipe to be frozen. Dirt and layers of paint will lengthen the freezing process. 2. Check all hoses, freezing jackets, threaded parts and nozzle for wear and replace any worn components. Make sure the nozzle is clean and clear. Select the proper size freezing jacket based on the size of the pipe to be frozen. Connect nozzle assembly to jacket, making sure that the nut inside of the brass grommet on the jacket is tightened securely to prevent leakage. Connect the hose to the nozzle assembly and to the CO2 cylinder and tighten securely to prevent leakage. 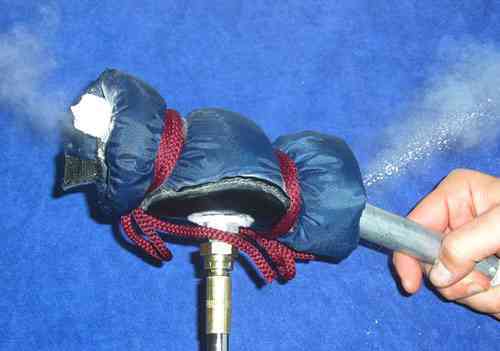 While holding the jacket firmly to prevent the nozzle from whip lashing, briefly open the valve on the cylinder to make sure the nozzle is clear. Always keep the freezing point 3 feet or more from a closed valve or connection. Always keep the freezing point 3 feet or more from another freeze. NOTE: failure to observe this 36 inch margin of safety can result in damage to pipe due to the expansion of water as it freezes. When torch cutting, welding, or soldering is to be performed on the pipe, keep the freeze at least one foot from work for each inch of pipe diameter when working on carbon steel or iron pipe. Triple the distance on copper pipe. Cutting, welding, or soldering too close to the freeze can damage the ice plug. Wrap the freezing jacket around the pipe using the Velcro strips to seal the jacket in place and tie the cords tightly around the ends of the jacket. After this step, the use of protective gloves and safety glass provided in the kit is recommended to prevent frostbite. Completely open the valve on the CO2 cylinder. Squeeze the jacket while injecting CO2 to form a solid, even block of dry ice around the pipe. Crush any lumps that form in the ice using a rubber mallet. The following chart applies to freezing completely stationary, 70ºF water in carbon steel pipe. Adjust times according to actual conditions, allowing more time for warmer water or slight flow of water. Multiply all times by 3 for plastic pipe. Pipe Size ½" ¾" 1" 1½"
Injection Time 1Min. 1.5Min. 2Min. 5Min. Waiting Time 3Min. 5Min. 5Min. 5Min. Total Time 8Min. 13Min. 21Min. 30Min. CO2 Consumption 1½lbs. 2lbs. 4lbs. 10lbs. Pipe Size 2" 3" 4"
Injection Time 8Min. 10Min. 8Min. Waiting Time 5Min. 5Min. 10Min. Total Time 39Min. 75Min. 126Min. Keep extra filled CO2 cylinders on hand. Have at least 2 full cylinders available when freezing 2-inch pipe, and 3-4 full cylinders for 3 to 4 inch pipe. All cylinders must be equipped with a siphon and must be kept upright when in use. For double freeze jobs keep double the amount of CO2 cylinders. A full 20 pound CO2 cylinder contains about 18 pounds of usable CO2 and weighs 45 Pounds. An empty cylinder weighs 27 pounds. Weigh the cylinder between freezes to determine its approximate content. If you are unable to form a solid dry ice pack, check the nozzle for blockage, make sure the CO2 cylinder is not empty, and make sure the water flow in the pipe is turned off. Continue shaping the dry ice pack at 10 minutes intervals during the freezing process. For optimum results, keep the ice pack formed tightly around the pipe using a rubber mallet. When the injection process is completed, frost should be formed on the outside of the pipe at the edges of the jacket. 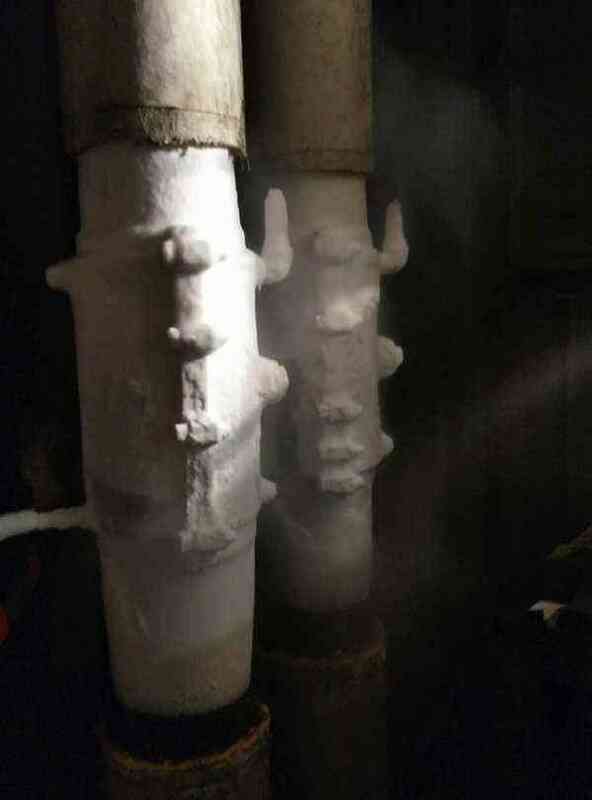 This indicates that the contents of the pipe are completely frozen. As long as this frost remains dry and stable, the freeze is being properly maintained. Leave the freezing jacket on the pipe while performing pipe maintenance. As a safety precaution, make additional 30-second injections every 15 minutes. 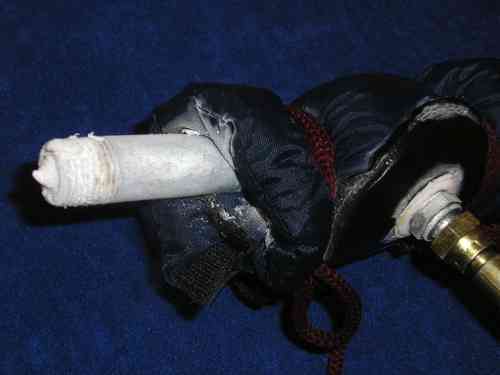 When work is completed, remove the freezing jacket from the pipe and allow the freeze to thaw naturally. Do not attempt to thaw the freeze with a torch as thermal shock damage to the pipe can occur. Always wear protective gloves and safety glass provided when handling jacket, dry ice pack, or frozen pipe. All CO2 cylinders need to be equipped with a siphon to drain liquid CO2 from the bottom of the cylinder. CO2 gas will not form dry ice. All CO2 cylinder valves need to be fitted with a safety-bursting disc to protect against over pressurization. If the cylinder is overfilled or subjected to temperatures over 100ºF, the bursting disc may rupture, allowing violent discharge of CO2 gas. Always weigh tanks to prevent overfilling. Store all CO2 cylinders out of sunlight and away from heat. Never transport cylinders in the driver's compartment of a vehicle, as a sudden rupture of the bursting disc could distract the driver. 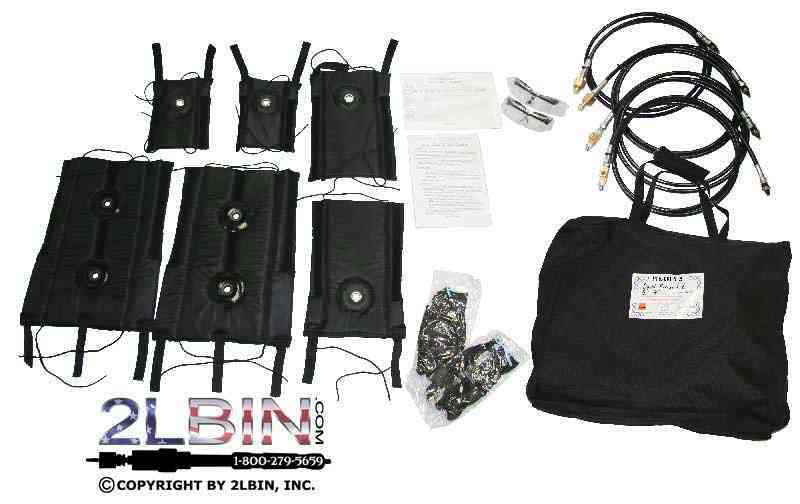 The 2lbin.com pipe freezing kit works best when the cylinder temperature is kept below 77ºF. It will not work if the cylinder temperature reaches 88ºF. CAUTION: CO2 is heavier than air and will collect in confined or low-lying work areas. Always make sure there is good ventilation to prevent suffocation. CO2 gas is odorless and invisible. Disperse CO2 before entering a confined or low-lying work area. 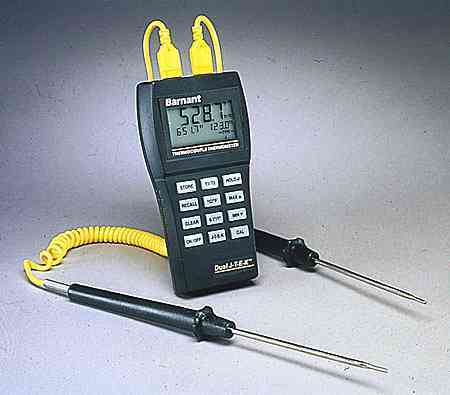 This device contains a variety of probes and meters for many field applications. Specifications: Dual J-K-T-E Thermometer lets you select from four thermocouple types--J, K, T or E. Accepts up to two thermocouple inputs. Manually stores up to 25 readings. Accuracy: ±0.1%. Type J and K Thermometers feature four-button keypad, on/off, °C/°F and Hold. Accuracy: ±0.2%. Stainless steel probes have 5-1/2"L glass-filled nylon handles and 5'L coiled PVC cables. Use General-Purpose Probe for liquids, gases or small surfaces. Penetration Probe penetrates soft or semi-soft materials. Air/Gas Temperature Probe features built-in perforated tip shield. Use Surface Temperature Probe for surfaces such as hot plates. Hypodermic Probe penetrates soft tissues and liquids without disturbing large sample areas. Roller Probe measures moving rollers and similar convex surfaces. Thermocouple Thermometry Kit includes either a J or K thermometer, three probes (general-purpose, air/gas and surface), 9V battery, instructions and case. Carrying Cases keep a meter and one probe together for quick, convenient access. Carrying Case with Window protects your meter while in use. Compliance: UL and cUL rated. Intrinsically safe for Class 1, Division I, Groups A, B, C, D hazardous locations. No. 40488 rated IP54, splash and dust resistant. Don’t be fooled by their size—these compact, portable units can detect hazardous gases in seconds. They have a digital readout and an audible warning signal with a rating of 85 dB. All have a high-intensity LED light that brightens when the audible alarm sounds. 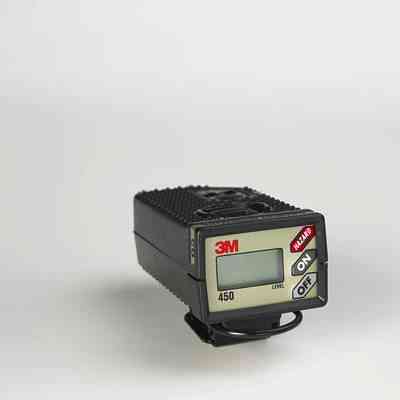 A calibration check must be performed on the detector before each use to verify that it is working properly. Calibration test kits for carbon monoxide and hydrogen sulfide detectors are sold separately. Temperature range is -4° to +122° F. For use in Class 1, size is 4" Lg.× 2" Wd.× 1" Ht. Detectors, with non-replaceable batteries, should be thrown away after their two-year lifespan expires. All have a vibration alarm and operate on one non-replaceable lithium battery (included). Size is 3" Lg.× 2" Wd.× 1" Ht. Calibration test kits are sold separately, and maintain the accuracy of the detectors. They include a cylinder of gas, regulator, tubing and carrying case.